We have recently completed our work investigating the dynamics and upward propagation of waves which are generated by the solar global eigenmodes. A lot of the background work is documented on this blog under the pmode label. 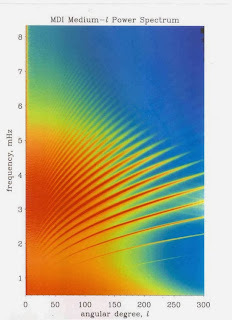 In this post I describe a series of hydrodynamic simulations of a realistically stratified model of the solar atmosphere representing its lower region from the photosphere to low corona. The objective was to model atmospheric perturbations, propagating from the photosphere into the chromosphere, transition region and low corona. The perturbations are caused by the photospheric global oscillations. The simulations use photospheric drivers mimicking the solar p-modes. In this post I review the work and highlight some of the results. Finally we review future work to investigate how the mean magnetic field itself would change the coupling of the global solar acoustic modes to the overlaying magnetised atmosphere. The discovery of solar global oscillations is highly remarkable and has resulted in the technique of helioseismology which has revealed Observations of William Herschel as early as 1778-1818 revealed a granular structure. Around 1904 studies by Pierre Janssen suggested these structures had a diameter of around 1500km. These were soon attributed to the convective cells. In the 1960's the spectrographic studies of Evans and Leighton were able to identify and measure the rising and falling motions of solar the solar atmosphere. Using Doppler shifts for different spectral lines the average turbulent velocity was measured for different heights. Leighton employed a technique different to that of Evans his approach study the doppler shift for a single spectral line (Ca-K band) but to scan two images across the solar disk. The resulting dopplergrams were subtracted to reveal an oscillatory motion with a period of 300s and amplitude of 300-400m/s. It was realised that this was a global phenomena. A number of theories were suggested for example the granules acted as a piston driving the acoustic osillations, in another theory (Lighthill and Lamb) it was suggested that the stratified solar atmosphere acts as a filter possessing characteristic cutoff frequencies. A third model, the resonant cavity model although it could maintain five minute modes the cut-off frequency at the temperature minimum of the solar atmosphere meant that the 5-minute modes could not escape into the solar atmosphere. Further observations (Frazier and Mein 1965) provided evidence that the oscillations were generated deep in the convective interior. In 1970 Ulrich's theory used a resonant cavity with its upper boundary just below the top of the convection zone. The theory provided a dispersion relation showing how waves of given frequency and wavenumber lay along define ridges. Initially these were not observed this was because it was necessary to observe the sun over a long time and a large area. With the rise of the global oscillations network and the big bear observatory such observations were possible and spectra like that of Ulrich's phase diagram were observed e.g. see below, the new discipline of helioseismology had arrived and we were beginning to understand the nature of solar global oscillations. As a student I remember a lecture on stellar interiors, it was claimed that this was a good area of study because it's difficult to look inside a star to verify your theory, therefore you have a greater freedom. Perhaps this speaker knew about the developments in helioseisomology it has changed things for our own star it's a developing and exciting field and that comment years ago fueled my curiosity. A well worthwhile read is the book Sunquakes: Probing the Interior of the Sun by Jack Zirker (see reference 12). It was recognised that turbulence in the convection zone generates acoustic noise continuously with some waves reflected back into the cavity by the photosphere. Thus the photosphere is driven up and down by evanescent waves leaking through the upper boundry with a spectrum which has a peak at five minutes. Since the advent of coronal seismology many space-based high-resolution solar observations e.g. SOHO, TRACE, SDO and IRIS (to name but a few) have provided evidence for wave phenomena in the solar atmosphere. The power spectra reveal strong 3-5-minute oscillations in all channels and in- clude some longer period modes too. Using SDO/AIA data we show in Figure (1) the power spectrum in nine AIA passbands for randomly selected single pixels in and Active Region (AR), Quiet Sun (QS), and a Coronal Hole (CH) on a randomly chosen day (22 August 2010) during solar minimum. The power spectra are derived by studying image sequences at solar minimum for the different solar regions e.g. AR, a typical QS region and a CH. The power spectrum in nine AIA passbands for single pixels in AR (black solid), QS (red solid), and CH (blue solid). 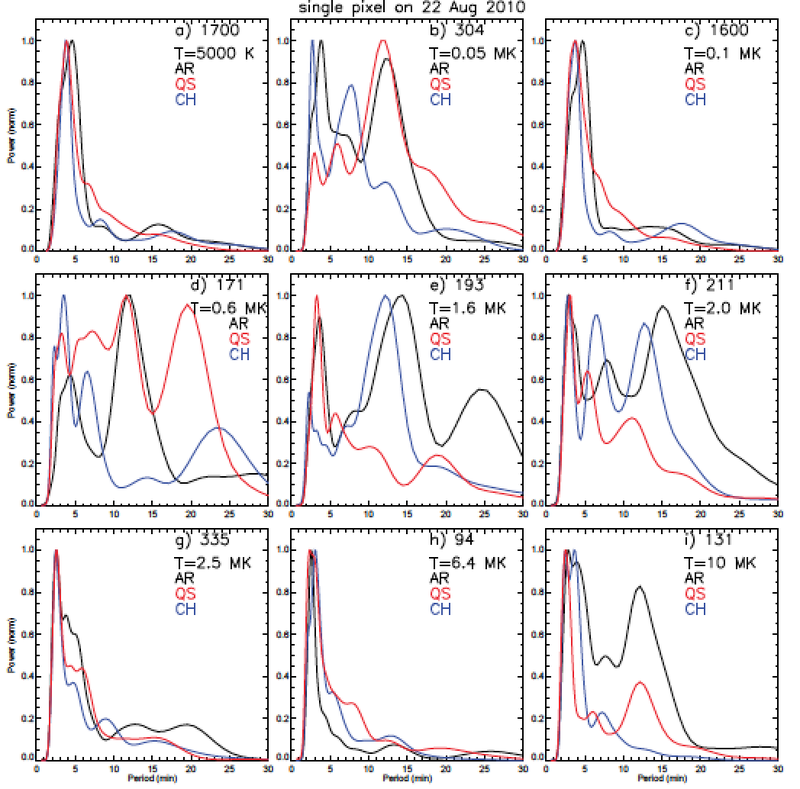 These results demonstrate the ubiquity of the observed 3- and 5-minute oscillations in all channels and regions and may serve as evidence of a global excitation mechanism. These observations are our strong motivation to model whether global p-modes may penetrate in the atmosphere. To investigate these phenomena we ran a range of numerical hydrodynamical simulations of a model solar atmosphere for the quiet sun. We studied both the motion and the energy propagation characteristics for a range of frequencies and mode numbers. The different driver modes are illustrated below for a vibrating membrane. This model is oscillator is located at the base of the model and is coincident with the temperature minimum. The solar global modes of oscillation can be understood from the gravitating slab model discussed in the blog post "Our Wobbling Star". The modes observed at the solar surface are characterised by two indices l and m. l is the number of nodes between the poles whilst the azimuthal mode number m is the number of modes around the circumference. There are many thousands of modes some of which are illustrated below. The completion of this work has been dependent on a range of research-IT services hosted and supported by The University of Sheffield. Research support was required throughout the full lifecycle of the project. This work was funded by the Science and Technology Facilities Council (STFC), UK this funding was crucial to develop the codes used to perform the simulations and the analysis. The computational models were run using the smaug code using the GPUs hosted on the iceberg high performance computer. Reference 11 provides details about the development and implementation of the code. We used revision 257 of SMAUG which can be checked out from the ccpforge code repository, this was checked out using the following subversion command. A subset of the final results was published on the research data archive service provided by The University of Sheffield. Since we are interested in the propagation of energy into the solar corona we computed the energy flux for different times and for different sections through the model. We also used time-distance plots to characterise the modes of oscillation. Since we ran a large number of simulations with different modes and frequencies we attempted to summarise the results by preparing a collection of videos. Each video shows the value of the vertical component of the plasma velocity (z-component) along different slices through the simulation box. The scale shows the velocity value in m/s. The green vectors show the velocity directions along a single slice through the simulation. The green surface at a height of 3.5Mm is the 2MK temperature isosurface. The simulation box is 4Mmx4Mm along the base and the height of the box is 5.7Mm. The driver for the simulations is located at a height of 0.5Mm. Our results support the notion that solar global oscillations may be a driver for a range of global dynamical phenomena resulting in chromospheric and low coronal Doppler and intensity oscillations which, after all, may contribute to the non-thermal energy present in the solar atmosphere. We would like to emphasise that these upper atmospheric ubiquitous wave phenomena may not arise solely from the photospheric p-modes. On the contrary, a range of sources including, turbulent motions from convective cells, local nano-flares, small-scale Kelvin-Helmholtz instabilities, or continuous reconnection events in the magnetic carpet may contribute to their excitation. Among others, we found that. An important caveat of the present work is the modelling of the active response of the atmospheric magnetic field. Although the plasma-β may be very low in the low corona, this approximation may serve an appropriate initial insight, nevertheless one needs to relax this condition and analyse how perhaps the mean magnetic field itself would change the coupling of the global solar acoustic modes to the overlaying magnetised atmosphere. Here, an interesting question would be to investigate whether slow or fast MHD waves are the key stakeholders in the re-distribution of the convective kinetic energy. It has been recognised that magnetic fields influence the propagation of solar acoustic modes in a variety of ways (reference 8). Hindman (reference 5) demonstrated the frequency shift of p-modes in vertical fields of different strengths. Cally and Goosens demonstrated that in the region of the solar atmosphere where the alfven speed matches the sound speed there is a significant transfer of energy between the different modes (see reference 7). A study of wave propagation in sunspot umbrae (see reference 4 below) reveals a suppression of wave power. The complexity of modelling physical processes in the highly stratified and magnetised makes it challenging to understand global oscillation phenomena. We have undertaken initial simulations with a uniform vertical field and using a (2,2) mode 300s driver. Some of the simulations have resulted in high frequency oscillations, these simulation artifacts can be filtered e.g. see the method used in reference 4. Our simulations clearly demonstrated the blockage of the 30s p-mode due to the cut-off for a magnetic field free atmosphere (see reference 6 below). However early results of computational simulations of the 30s mode using a magnetised solar atmosphere clearly demonstrate a leakage of energy in the solar corona the observed speed of propagation of the leaked mode is suggestive of mode conversion. 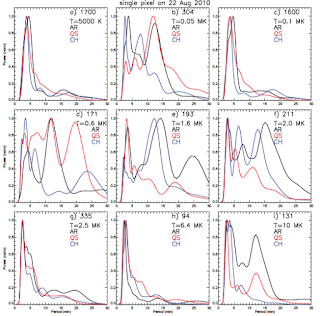 Khomenko and Collados review the modelling and observation of sunspot waves in reference 9. Further work will be undertaken using larger domains with greater resolution using the smaug+ code described in reference 13. Release versions in the release folder and development versions (e.g. smaug+) in the dev folder.